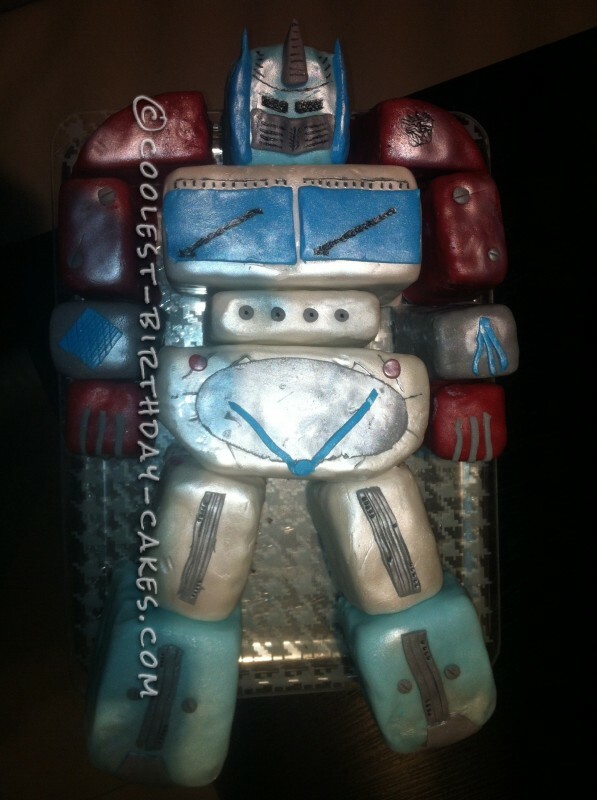 This Optimus Prime cake was my first ever attempt at baking. I originally saw this cake on coolest cakes.com and thought “that’s amazing, my son would love it”. I knew it would be a challenge, but totally underestimated how big a challenge it would be. Being a total novice I didn’t have any real baking tools, so made do with what I had and bought a couple of essentials along the way. Also referred online A LOT! 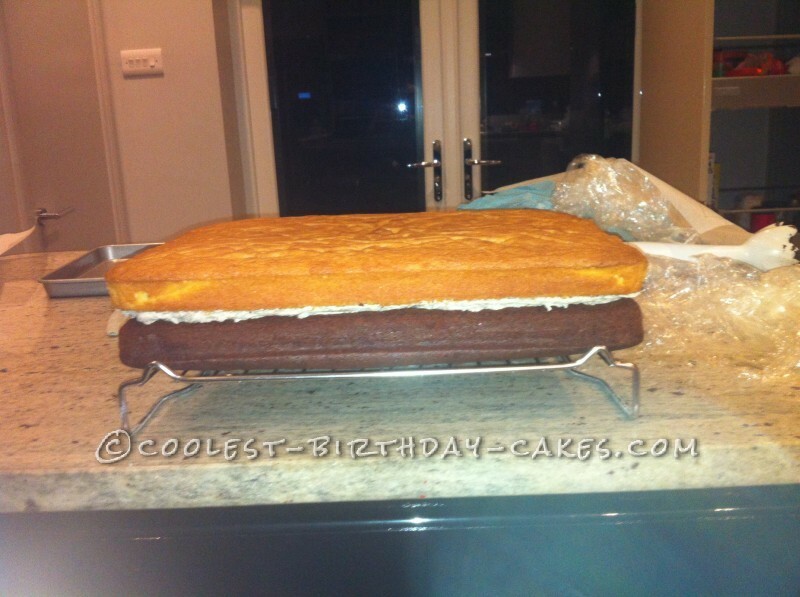 So, first off I made two large rectangular sponge cakes using a shallow roasting tin. I made one vanilla sponge and one chocolate sponge. I then sandwiched them with Oreo butter cream and wrapped them up in cling film and froze overnight in the freezer. This made them easier to handle, as being so large was tricky picking the slabs of sponge up without them breaking! In the meantime, I used a sheet of baking paper the same size as the sponge and began to draw out Optimus. I stuck to the original version I’d seen and tried to use simple shapes to form his robotic body. I then cut these pieces out and used them as a template to carve my sponge straight from the freezer. Being frozen meant it was easier to cut each piece of his body. Note, this was a very pain staking process, as there were 16 individual pieces to cut out! Once all the pieces were cut out, I covered each piece in a thin layer of butter cream and put in the fridge to set. Again quite tricky and time consuming as all the pieces looked similar! I drew out another copy of his body so I knew where each piece had to go when it came to assembling him. Once the butter cream had set I went about icing him. I’d bought ready colored icing from hobby craft in the U.K., but found it really hard to use and roll. Also with this being the first cake I’d ever attempted I was unsure of how much fondant icing I would need. At half past midnight before my sons big day, I realized I wouldn’t have enough to cover him! I panicked and drove to a 24 hr supermarket to get more icing. I ended up using white ready roll fondant which I colored with gel color paste. This was very hard as need a lot of needing to create a strong color. Also managed to use what colored fondant I had, once I got the hang of rolling it. I put him together using wooden skewers and tooth picks and did all the fine detailing with an edible black baking pen and small pieces of fondant. I finished him off with a silver shimmer spray. I finished up at 4am! 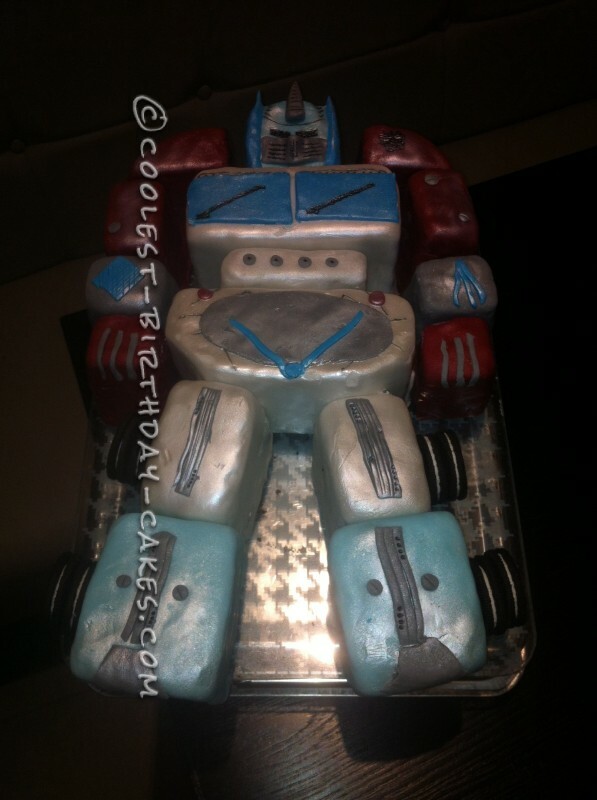 There was a few times I wanted to give up but knew I couldn’t as my son had already told people he was getting an Optimus prime cake and I knew how disappointed he would be if he didn’t have one. Overall I was happy with how he turned out, everyone thought he was brilliant and my son was over the moon, so it all worked out in the end. The cake was moist and rich and enjoyed by all. He also came out really big so enough cake to feed 30 people! I also have enough ready rolled fondant left over to bake another 4 Optimises! Luckily I enjoyed the process so will be baking again for my DD’s birthday in February. Thank you to Patty who submitted the original cake.